Epic salsa 476. "Bronze edition". A special Swift Epic 476 salsa rod fitted with bronze hardware and beautiful semi-preserved matching bronze silk wraps. The titanium-bronze plated guides are classy and are the most durable in the industry. They are a nice addition to my rods along with my new bronze anodized cap and ring reel seat. The very elegant redwood mortised wood insert truly complements the beautiful Epic salsa colored blank. I had anticipated this build project for some time but as you all know, good quality rods require time. Everything on this rod was made on special order and took a long wait to get. 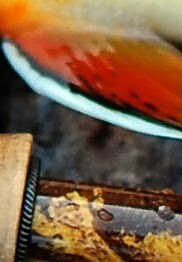 My epoxy finishing work, as it appears in the detailed images below, is proof of my dedication to offer the best quality finish that can be done. I try to put the most amount of time and attention to detail in the finishing work and in the finished product overall needed to achieve both beautiful aestetics and functionality at the highest standards. Of course this can come costly but it's what I always strived for in the goal of building that "perfect" fly rod. I'm afraid some rod companies or people involved in this business are more concentrated on time and cost effectiveness than on the quality of the fitting and finishing. It is an important aspect that's being overlooked by many. I really hope I'm not offending anyone with this statement. I have deep respect for traditional builders and companies alike that strive to offer the best quality possible. 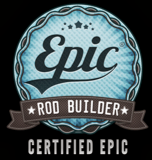 This Swift Epic S2 fiberglass rod is the highest performing among glass and it is built to last. I am offering this rod for sale at $650 shipped (introductory price). If interested in this beautiful fiberglass rod or have any other build project in mind please don't hesitate to contact me. SOLD. Old Gary Loomis IMX. In progress. Just received a good old Loomis IMX in the mail from a dutch guy who has been admiring my work for some time. This famous "vintage" graphite blank was wrapped in rusty red silk and fitted with classic components. Dark redwood insert and bright nickel hardware. A beautiful reversed half well grip to remind of the good old rods that were made in the past (Loomis IMX, Sage LL, etc). Stay posted to see this classic graphite rod finished!